Algarve holiday houses, self cartering apartments and B&B. Welcome in the to individual holidays in the other side of the Algarve! In the Algarve, Aljezur, situated in the south west of Portugal from the Cape Vincente in Sagres and north to the Alentejo region is the Western Algarve it is one of the most beautiful and unspoiled nature parks in Europe known as the Costa Vicentina. 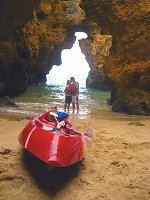 Here in the Western Algarve along the N120, villages like Aljezur, Rogil, Carrapateira, Odeceixe or Arrifana / Vale da Telha offer everything that is necessary to make a perfect vacation to relax or an adventurous escape from your everyday life. The nature park Costa Vicentina surrounds with its impressing beauty innumerable beaches, like Arrifana, Monte Clérigo, Amoreira or Amado and the beach of Odeceixe. Experience unique sunsets on the cliffs, long walks or guided tours in the natural hinterland of the Algarve. Surf individually or with one of the local surf schools at the best surf spots of the Algarve. Go Equestrian tours or biking through one of the largest cork oak and eucalyptus areas in Europe. Tailor your individual holiday and enjoy the luxury of a private accommodation in the panorama of the Monchique Mountains and the Atlantic, away from the mass tourism of the Algarve. There are a selection of the most beautiful vacation homes, self cartering holiday apartments a B&B or away from the overflown South Algarve beach front in the hinterlands a accommodation in a quiet Quinta at competitive prices or luxury.